"It's fantastic"' yelled Judy from the back of the tandem as we swept around another bend and gained still more speed. Before us lay the Atlantic, surging against vertical cliffs, the wind buffeting us, the rain holding off. It was exhilarating riding - the best since we began this trip in Portugal - the kind that makes your senses come alive and leaves nerve ends tingling with the excitement and sheer joy of being alive. 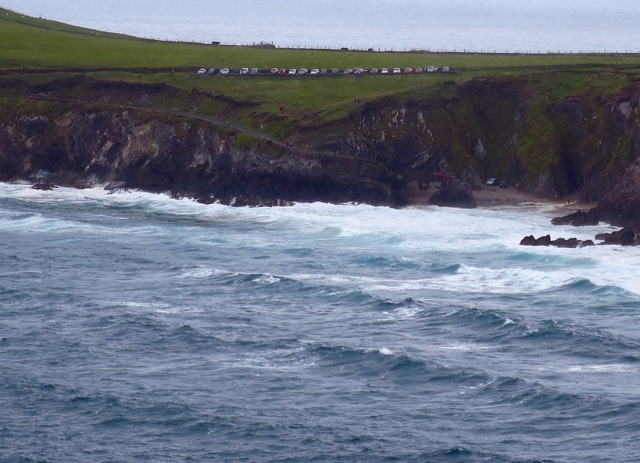 Looking across to Slea Head as the Atlantic swells roll in. 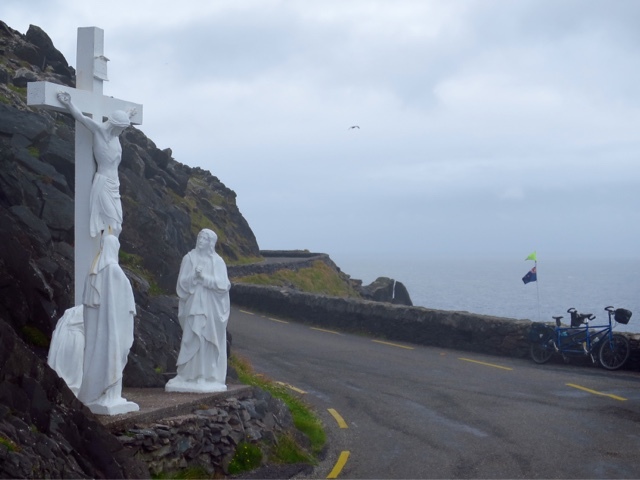 We have had this kind of riding for three days in a row now, but it began before that with a 49 km loop ride from Killarney, Co. Kerry, through the glacial Gap of Dunloe. It's a tourist route, but cars are banned. People are forced to walk, cycle or take what's known here as a jaunting car (horse and cart). 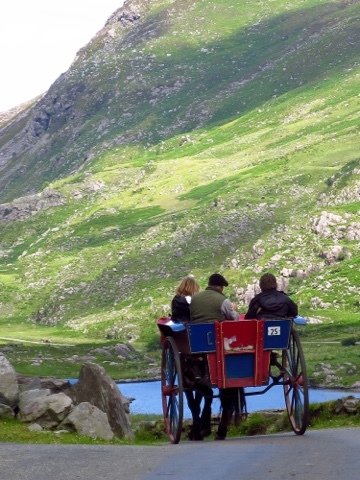 A jaunting car on the Gap of Dunloe. 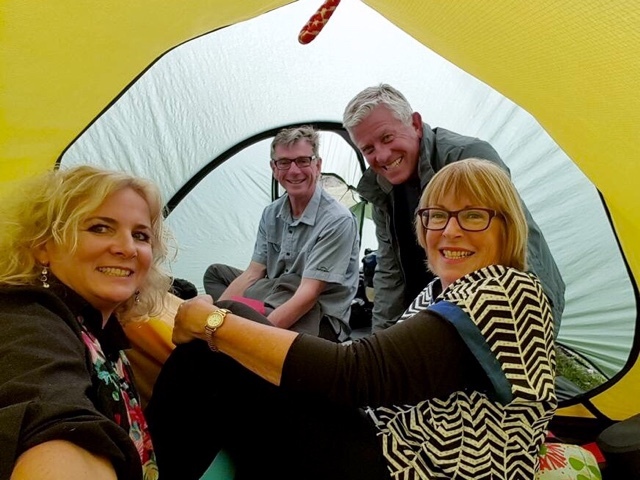 We left our tent and other gear at our campsite and with a much lightened bike pedalled our way up to the Gap, dodging the horse poo, the jaunting cars and the walkers with their twin walking poles clack, clack, clacking on the mostly sealed surface. The view from the top was of barren hillsides (mountains, the Irish would call them but as New Zealanders that seems to be stretching it a bit), a small river and a lake, the tones muted, almost monochrome in the overcast. It was bleak, but we are getting used to it. It's Ireland and in its way it is truly beautiful. 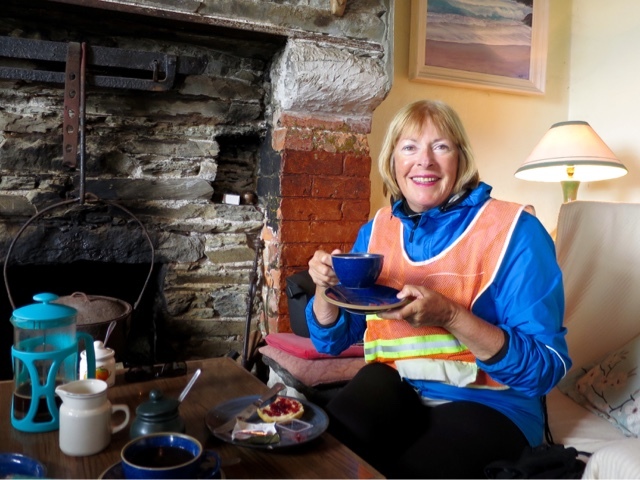 We raced down the other side, had coffee and scones at Lord Brandon's Cottage and then found an easy way back to Killarney on a path meant for walkers only. 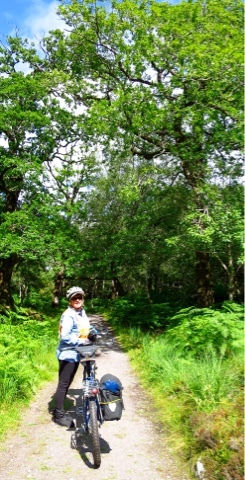 An easy path back to Killarney after cycling the Gap of Dunloe. 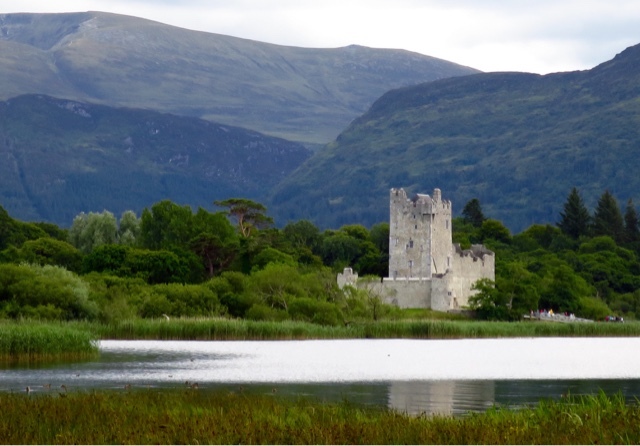 Ross Castle, on the outskirts of Killarney. A couple of days later we were on our way to Dingle in the sun, then a loop around Slea Head and on to Tralee. The coastal scenery has as Judy says, been spectacular. It's not pretty in that Kiwi-sunshine-and-summer-cove kind of way. It's West Coast wild minus the mosquitoes and it just keeps on giving - around every bend lies another great view. And what better way to see it than in its bleakness - the wind tearing at our clothing, the bike buffeted by gusts so strong it becomes a battle between man and nature. No wonder we feel alive, energised, and no wonder someone has come up with a marketing strategy which calls this the "Wild Atlantic Way". 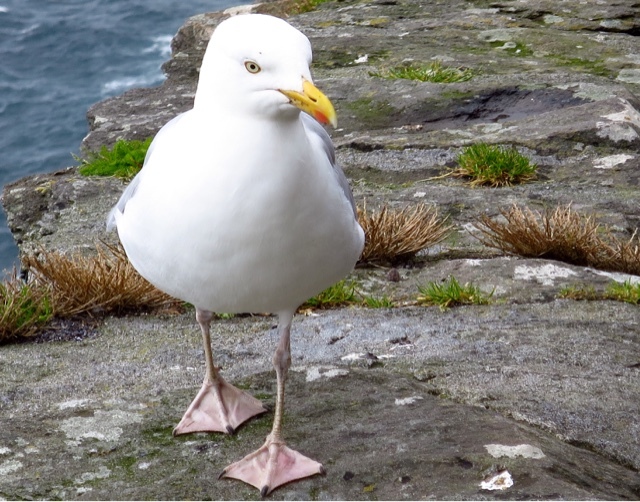 Sometimes only the seagulls are left standing. On the loop around Slea Head. This was a relatively sheltered spot and we sat and ate our fruit scones. Coffee break, Slea Head. The elderly owners of the house/cafe have lived here for years. Originally they ran the property as a B and B, but now find it too much. They do a good line in rhubarb pie with cream. There are other things, beyond the scenery, that make this place so special to us. 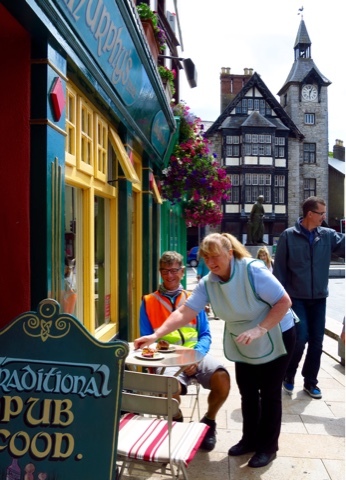 One is the well known friendliness of the Irish - the stories we have all heard are true. There's the music. On a wet night in Dingle we visited a couple of pubs - one delivered up foot tapping music of the traditional kind while the other aimed at a younger audience. On a screen at the back we saw the last seven minutes as the All Blacks came from behind to beat South Africa. Elated, we attempted to leave the bar but were waylaid by a group of young men who insisted we join in a wild, uncoordinated dance to "heh, heh, what's going on". Judy's umbrella served as a pretend microphone until we were finally spat out the door, still fizzing with excitement. A beehive house built without mortar. And then there is Ireland's history that goes back to the hunter gatherers who arrived at least 9,000 years ago. 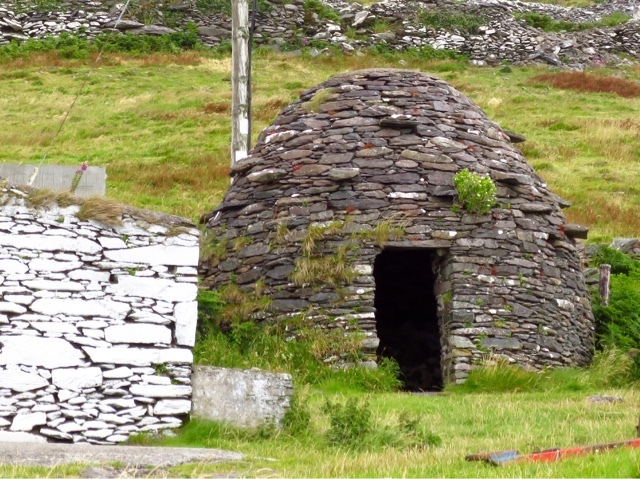 The signs of occupation through the ages are everywhere in this sometimes lonely landscape - from ancient burial chambers to castles, strange beehive shaped houses and cottages abandoned during the potato famine. On that ride round the Slea Peninsula we stopped at Dunberg Fort, where carbon dating suggests humans lived around 580 BC. 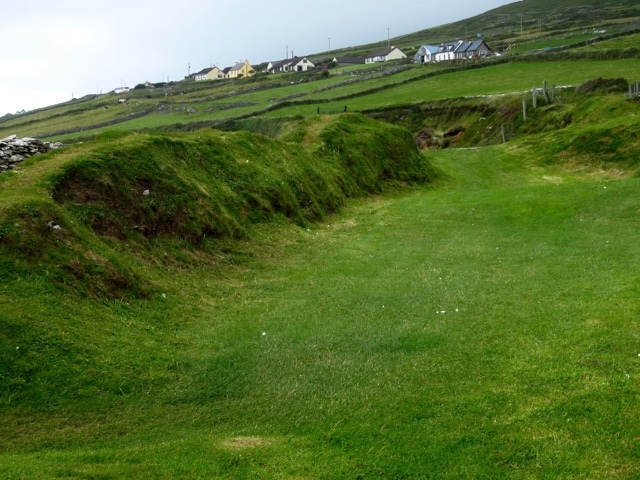 Dunberg Fort is built on a sheer cliff, and has a defensive structure that includes four lines of banks which originally would have wooden palisades on top. They must have been tougher than us - the cold drove us indoors to watch an audio visual. Throughout it, the office cat sat on Judy's lap demanding attention. 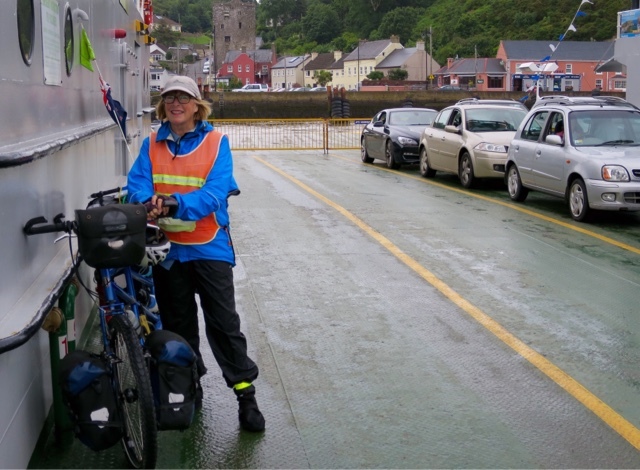 On the third day we rode from Dingle to Tralee, a short hop of 52 km and made even quicker by that wind - this time like a firm hand pushing from behind. At times GPS George was clocking us at 40 kph and we surged up the hills despite our load. Along the way, more history, this time in the village that was the home of Antarctic explorer Tom Crean. We spotted the pub first. It was called the South Pole Inn. Across the road was a statue of Crean, there were Crean walkways and even a lump of South Georgia rock brought back to help remember him. 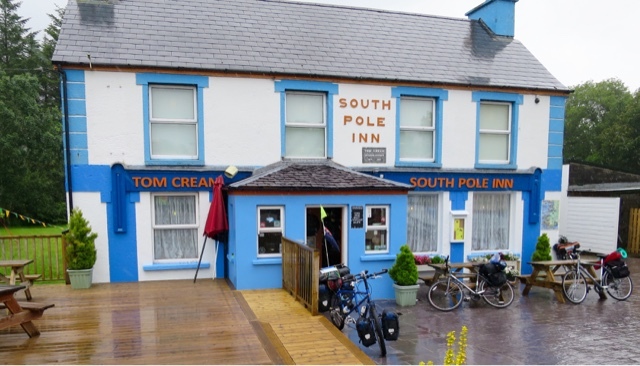 After three polar expeditions and a long naval career, Tom Crean returned to the place of his birth, married, had children and became a publican. 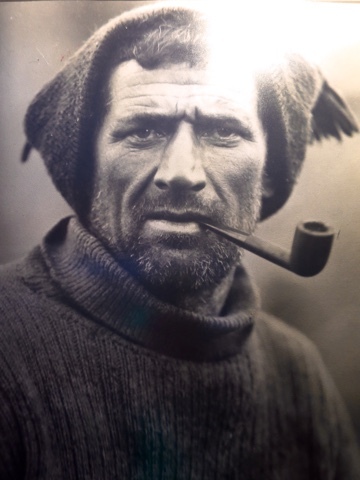 Tom Crean, polar explorer. He died aged 61. 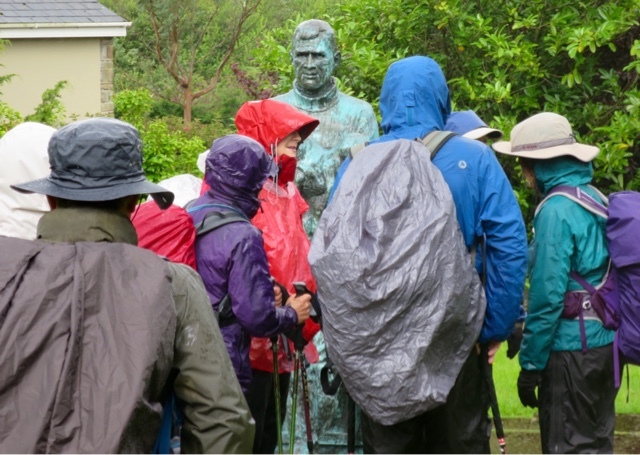 Walkers gather around a statue of Tom Crean in his home village of Anascaul. 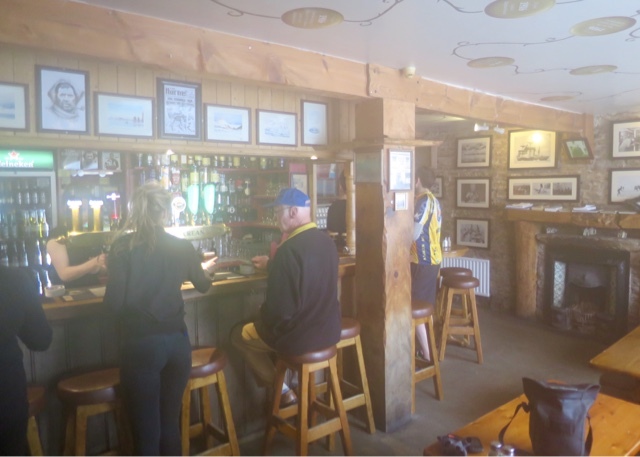 We shivered in the cold and went inside the pub which Crean owned after three Antarctic expeditions and a long naval career. The walls were covered with photos - some familiar - of the ships and men who risked their lives to explore the remotest continent on earth. Camera fogs up in the warmth at the South Pole Inn. I tried to take photos of the bar but the rain had got at my camera, fogging the lens. It's the sort of thing you might expect at the South Pole, but then again this is Ireland in a bad summer. Anyone remember Laraine Stollery? 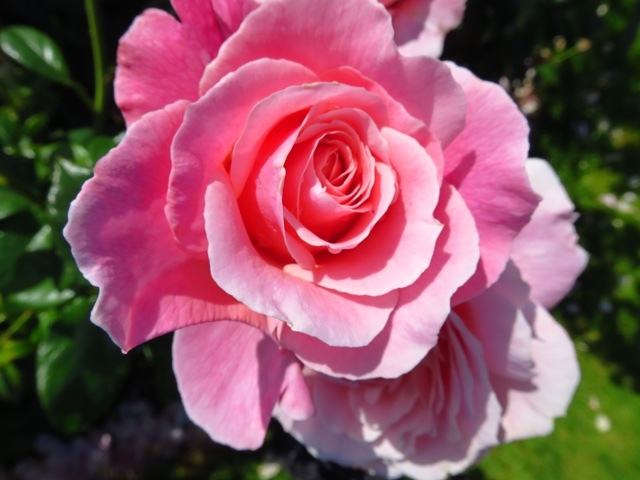 A New Zealander, she won the Rose Of Tralee competition in 1966 and is immortalised in the Rose Gardens in Tralee. Most Replaced Item: Mike's towel - on his fourth: 1 smelly, 1 lost, 1 dish cloth proved too small. Hardest Item to Replace: A new flouro pennant for the bike's flagpole. Sometimes it's hard to beat a good generalisation and Judy came up with one the other day. "There's something wistful about the Irish," she declared, her voice barely audible above the noise of the wind whistling round my ears as we sped along on the tandem. 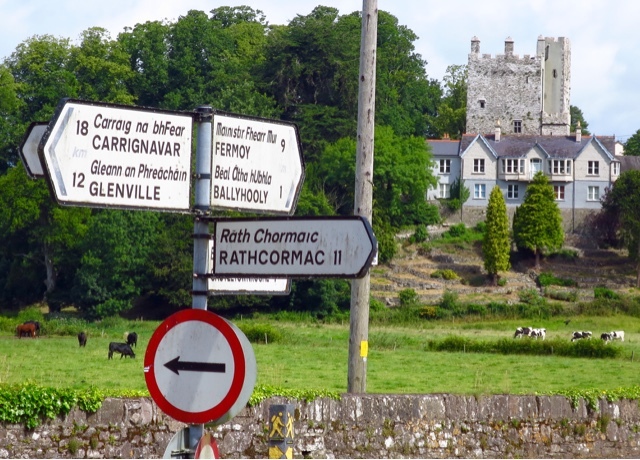 Strange place names - Ballyhooly was a favourite but there were others such as Ballynaclash, and Knockanore. I lost the next few words, then heard,"take that man back there, mowing the grass. His kids in Australia, showing no signs of coming home. He was wistful. And there are lots of other Irish like him." "Are you sure it's wistful? What about sad, or just plain lonely?" "No, no, it isn't sad," came back Judy's voice. We had slowed and I could hear her better. "He was sort of accepting. He was definitely wistful. Heading north up the Blackwater River on the first day. I reflected on this and thought about the man with the mower. 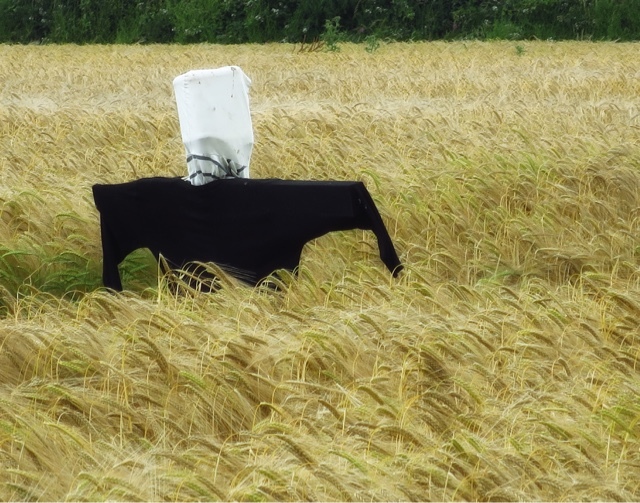 He had seen us coming, turned off his machine and waited on the verge making it perfectly clear he wanted a chat. One son in Melbourne, a daughter in Brisbane. He probably thought we were flying an Ozzie flag, not a New Zealand one. Disappointed to discover we were kiwis. "Nice cities - Brisbane and Melbourne," we told him in an effort to make him feel better. He shrugged, he knew that, he had visited both children recently. 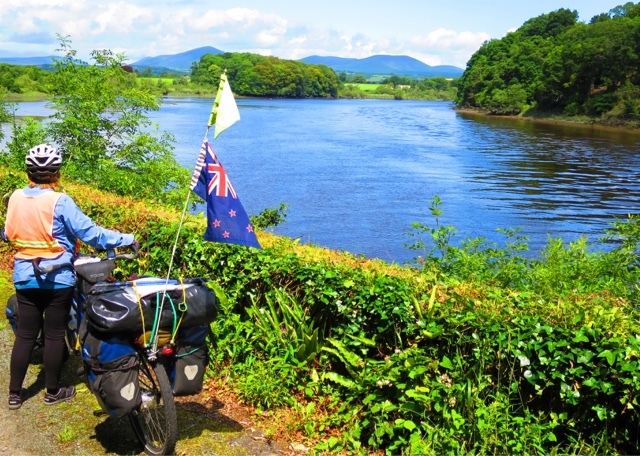 This happened as we spent two and a half days cycling the Blackwater River, from its mouth on Ireland's southern coast near Cork to its upper reaches near Killarney. 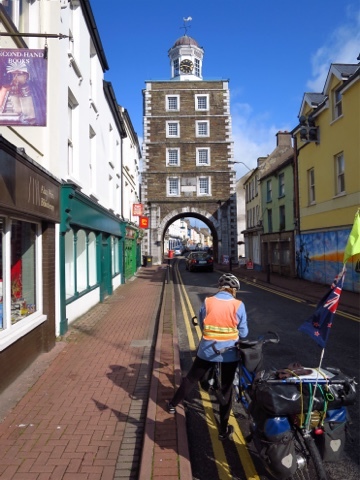 Youghal's clocktower as we ride out of town to follow the Blackwater River upstream. It was a beautiful, peaceful ride and the weather was kind - or as kind as it gets in an Irish summer. 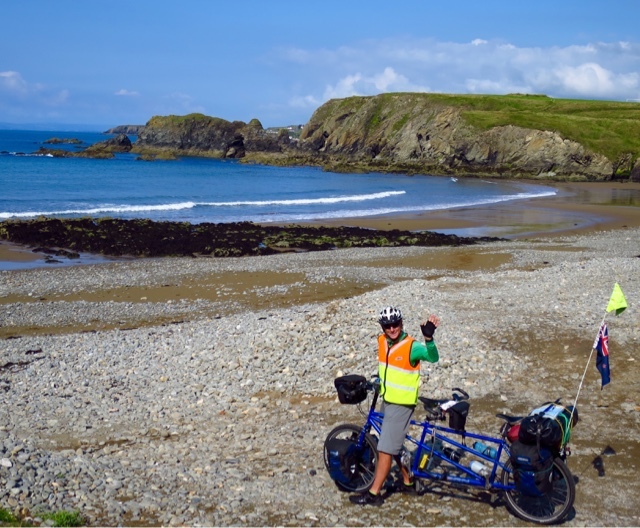 We had chosen this route after reading about it in the excellent guide book "Cycle Touring in Ireland" by Tom Cooper, who along with GPS George is our new best friend on this part of our travels. 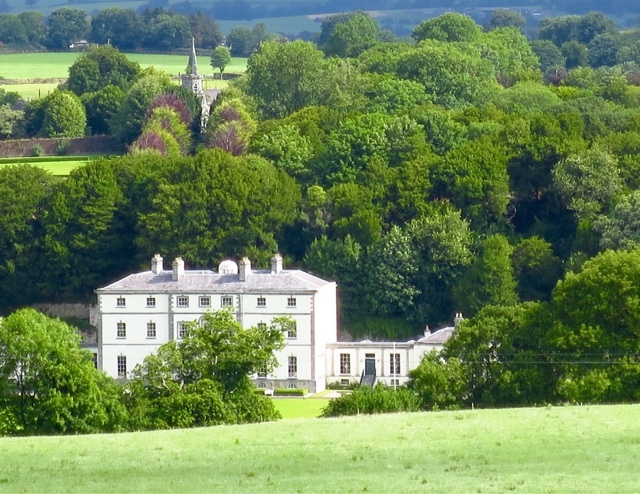 The mansion of Riverdance star Michael Flatley lies close to the Blackwater River near Fermoy. He's said to have spent €40m restoring the building. Last year burglars broke in and stole €250,000 worth of rhino horns from his private collection. 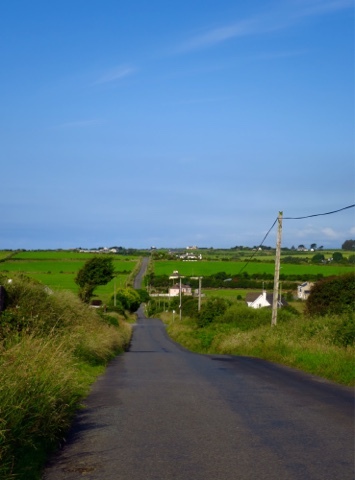 Tom reckoned that the first day's ride was one of the best day rides in Ireland, and he really sold it to us when he referred to the route as "flat". So we cursed him when we discovered lots of twists and turns and uphill bits. We couldn't get up them in first gear - usually a sign that the slope is more than 10 degrees - and to make it even worse, a couple of the downhills were so steep we had to walk down them to avoid overheating the brakes. Judy with Helen Lyons who with her husband, run a B and B at Fermoy where we stayed on our first night up the Blackwater. We almost always camp, but occasionally there is nowhere within range. A B and B gives us a night of comparative luxury along with the opportunity to meet the locals. 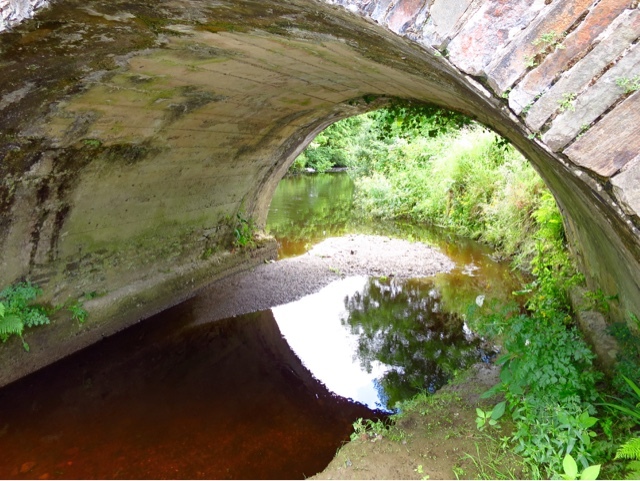 That aside, it was all in a day's ride - tranquil surroundings with glimpses of the river, overgrown ruins and some fine, modern properties in the more open countryside. On our second night we stayed at a B and B in Millstreet and Judy's generalisation about the wistful Irish looked questionable. Our hosts had two adult sons living in Australia, and they were both planning to come home to live permanently. Other young Irish were doing the same. 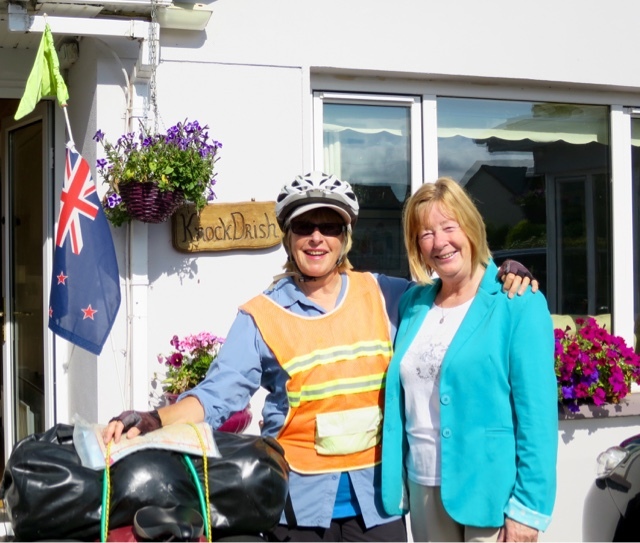 Judy with Noelene, our B and B host in Millstreet. She and her husband have two sons in Australia. We spent part of the evening in a local pub where everyone - including us - was glued to the TV watching the rematch of the Gaelic football final between Cork and Kerry. It was enough to send me off googling "Irish emigration". It took only a few moments to find a news story based on figures from the Central Statistics Office which said the Irish exodus declined for the first time in seven years last year (2014) - down 20%. But in spite of that, far more Irish left than returned - 40,700 headed off abroad looking for better opportunities compared to just 11,600 who returned. Nothing new in that, it had been happening for centuries. Six pubs in a row in Knocknagree, separated by O'Leary's Funeral Parlour. Back on the bike, we neared the top of another climb and Judy had moved on. "We have to stop," she announced. "I need a drink of water." Last view of the Blackwater River as we leave it to ride the last few kilometres to Killarney. 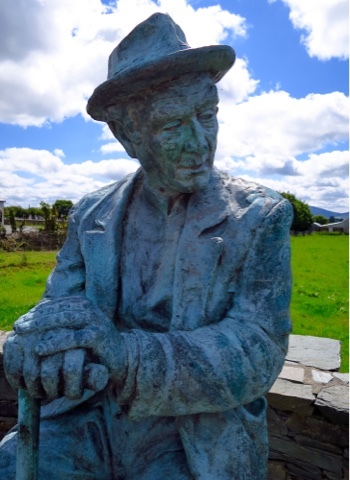 Statue in Gneevgullia, Co Kerry, of Eamon Kelly 1914 - 2001, actor and seanchai (storyteller). Best known for his storytelling on stage, radio and TV in Ireland. 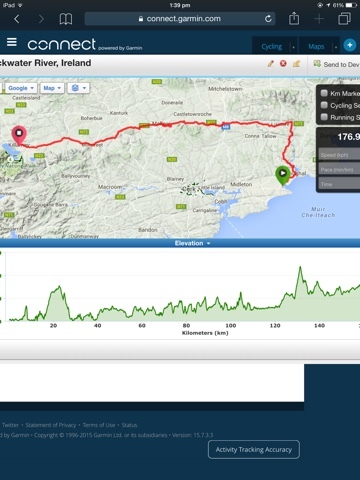 Coldest Day's Ride This Trip: 16 July, 56 km from near Dungarvan to near Youghal. A one day heat wave threatened to melt southern Ireland today. The temperature soared to 18 degrees C, the sun shone all day, and two cyclists were forced to peel off their merino wool tops for the first time in a week. The day before southern Ireland's heatwave and this cyclist is wearing a waterproof jacket, leggings and overshoes. 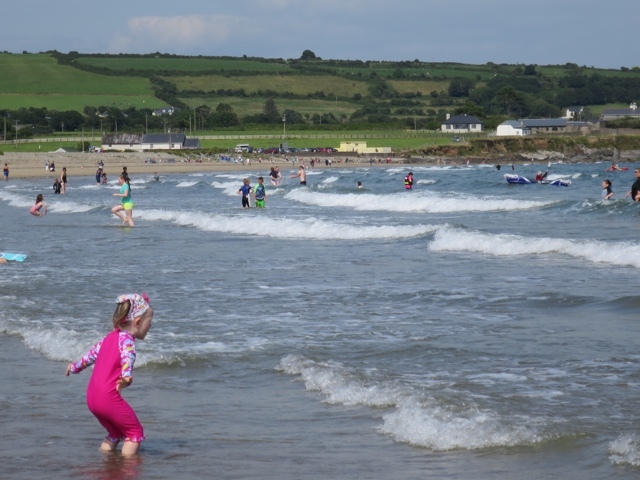 Waterproof leggings and overshoes were stuffed away in panniers and the Irish flocked to the beaches at Tramore and Clonea Bay where they paddled, swam and picnicked. Testing the water at Clonea Bay. The Irish are a hardy lot. The cyclists - still not convinced summer had arrived - sat on the beach in their fleece jackets and ate fish and chips in an attempt to ward off what they perceived as a cool breeze. 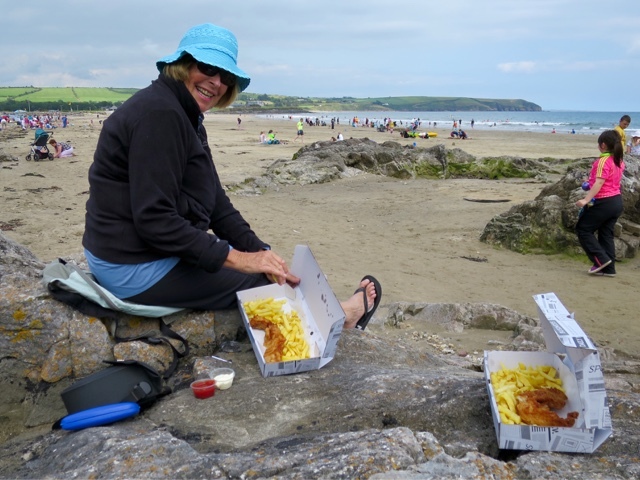 Fish n chips and a heatwave - of sorts. 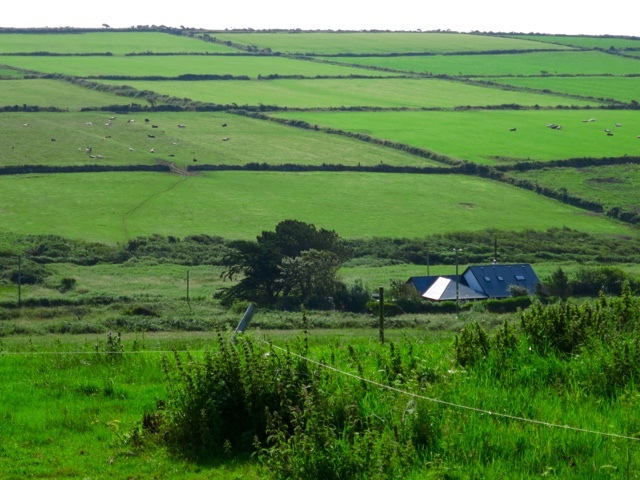 Afterwards, they admitted it had been a perfect day, cycling along the coast road with views out to the Celtic Sea. Even the hills were rideable. Hardly any traffic, rideable hills, perfect cycling. The cyclists began by doing a good turn for two men stranded on the roadside with three large dogs. "Couldn't borrow a cellphone could we? asked one of them. "Our mate has just left us here. Don't know what's the matter with him. I think he's crazy in the head". Judy passed over her cellphone and a rescue call was made. "Thanks a lot. I'll pray for you. You're good lads," one of the men said, leaving Judy wondering if she had forgotten her lipstick. On the beach at Annestown. 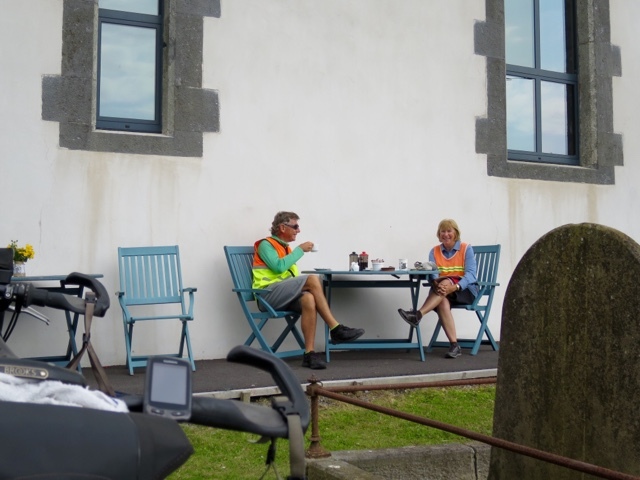 At Bunmahon an elderly couple offered to make coffee when they learned the cyclists were waiting for the only cafe to open at 11 am. The offer was declined with thanks, before the cyclists perched themselves at a table at the cafe in the sunshine - not too hot, not too cold, just right. 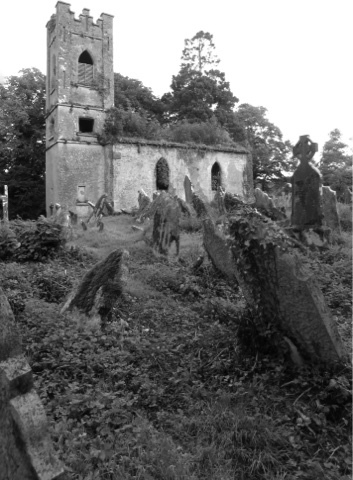 Hanging out among the gravestones at Bunmahon, where the church has been turned into a cafe and tourist office. The cafe was in an old church - repurposed as a tourist information office - and staffed by at least four women, one of whom was a Finnish student on work experience. She chatted to the cyclists but eventually it became clear she was less interested in them, and more interested in an excuse to stand outside and soak up the sun's rays. Finland was cold she told them, but at least the houses were built to be warm, unlike those in Ireland. She hadn't been warm since she arrived. On the road, heading west from Tramore - hardly a cloud in the sky. 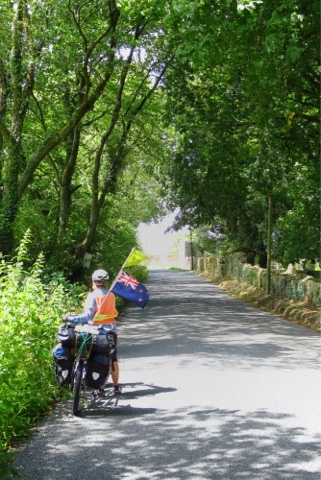 The cyclists resumed their journey west along the coast, but decided it was too nice to spend the day clocking up kilometres. At the first campground they turned off, put up the tent and spent the afternoon at the beach. The forecast for tomorrow is summed up in two words - rain, wind. It's not called the Emerald Isle for nothing. "Where could we go next summer, somewhere not as hot as here (Eastern Europe)," said Judy the Stoker as we both gulped water. An idle thought bubbled up. "Ireland," I said. "Colder and wetter." Judy seldom forgets even the most idle of conversations, so a year on here we are and so far I have been proved right on both counts. The rain started in Wales as we worked our way west. On my 65th birthday we woke to rain in Tenby. Packing up meant the inside of the tent was soaked by the time I had it stuffed in its bag. 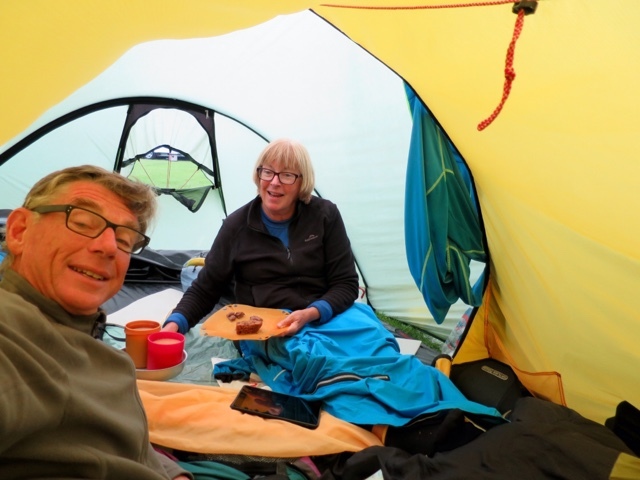 We cycled all day in the rain and unpacked the tent in the rain. We did our best to dry out the interior with Judy's "happy" towel, which she uses to wipe the sweat from her brow in hot weather. The rain had discouraged us from seeking out a supermarket during the day and my birthday dinner consisted of our emergency rations - instant soup and a freeze dried backpacking meal of roast lamb, veges and mashed spud, brought all the way from New Zealand. It wasn't bad under the circumstances, though the birthday cake that followed was a tiny piece of leftover bara brith (Welsh fruit cake) and three squares of chocolate each. No wine. A small piece of cake and three squares of chocolate each. 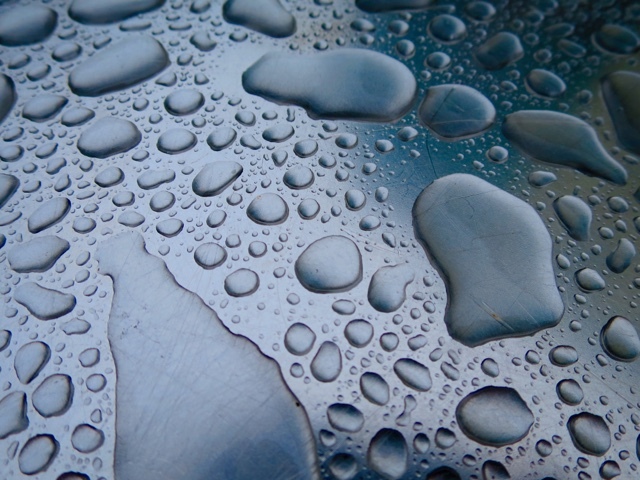 The rain pelted down. We listened to music on the IPad and found ourselves thoroughly enjoying the moment. We were in shelter, dry at last and snug as a couple of bugs in a rug. We settled back content in the knowledge that at home MP Winston Peters was sending out my pensioner's Gold Card. Inside the tent we sang along with Jackson Browne - Running on Empty. 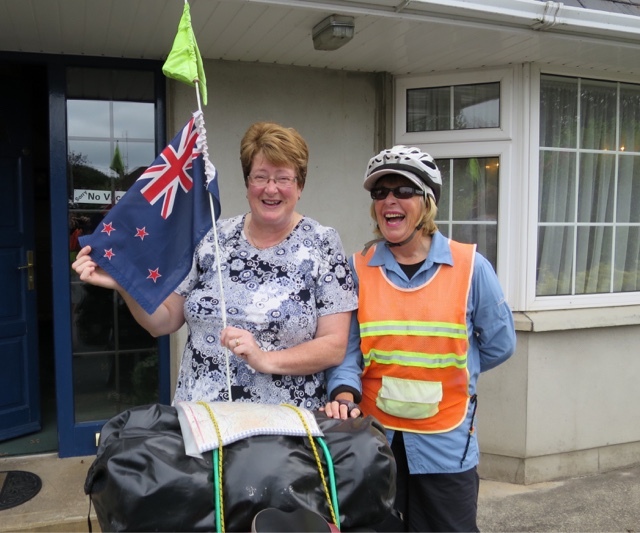 We had a two or three day respite and then crossed from Wales to Rosslare, Ireland. It was an overcast but dry evening. It wasn't to last. In Wexford we had a solid 24 hours of rain and high winds. 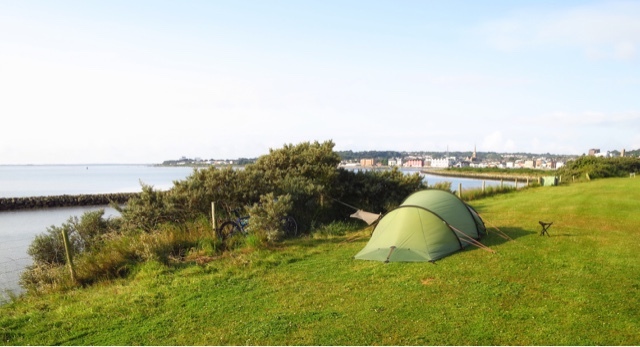 Foolishly we had put the tent up on the harbour foreshore in the lee of some shrubs, only to have the wind change direction in the night. 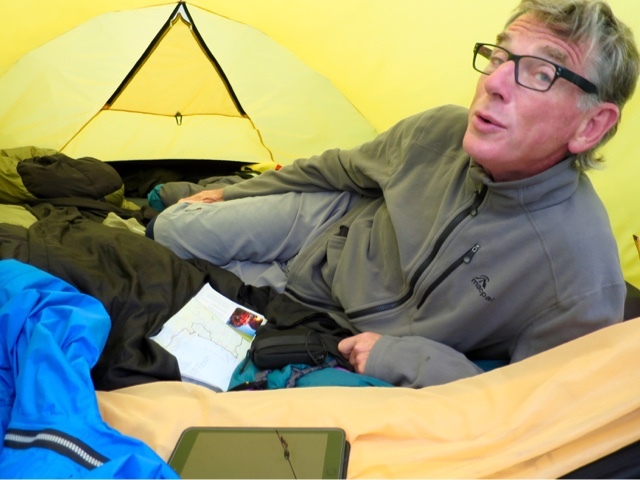 We were almost blasted out of our sleeping bags and for the first time started to question the tent's ability to withstand the forces of nature. The next morning, even the locals were apologising for the weather. "You should have been here a fortnight ago," said one. "We had a really good start to summer." At last a break in the weather at Wexford - the driest and sunniest place in Ireland. This morning began fine. There was blue sky, even if the wind did carry a wintry chill. As I write this, the cloud is building and it's possible, very possible, that we will have more rain. But it's not nearly as hot as Eastern Europe and I'm just waiting for a question from the Stoker,"where could we go next summer - warmer and drier than Ireland but not as hot as Bulgaria?" 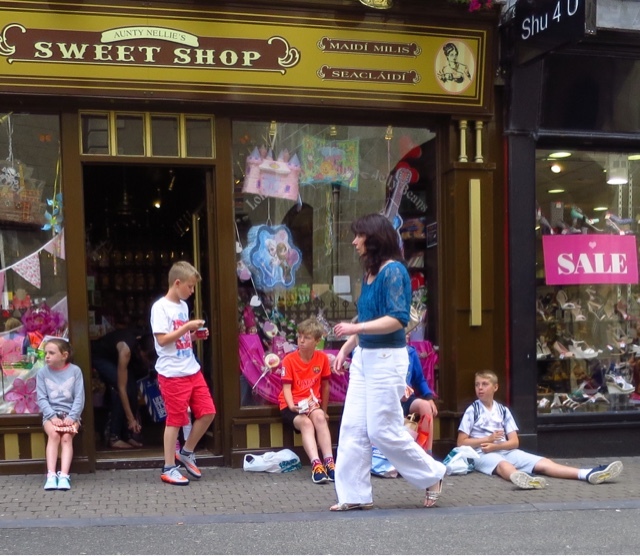 Outside Aunt Nellie's Sweet Shop, Wexford. Judy the Stoker: "Yuk, your hands are all covered in grease. You need to wash them again." Mike the Captain: "Nah, I'll have a shower later and shampoo my hair. That always gets my hands clean." Judy the Stoker: "Yeah, and I guess the grease helps hide the gray coming through." Photo: Lisa Barraclough Cammell. Lisa and Brett Cammell joined us for a night on the town in Wexford. Here we are sheltering from the storm before heading out. It was wonderful to spend time with a couple of Kiwi friends, and be able to compare home with here. Guess who comes from New Zealand? 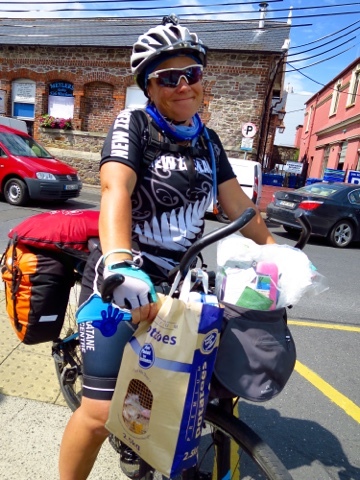 We met Gina Plumpton, Whakatane, in Wexford where she had spent the morning shopping and the afternoon trying to cram the goodies on her bike. Current Location: Fishguard, Wales - bound for Ireland. Distance since Lisbon, Portugal: 2,441 km. Health: Judy the Stoker shaking off a bad cold, Mike the Captain fit as a buck rabbit, The Beast of Burden purring like a kitten. "Give Dylan my regards," called the elderly farmer as we cycled off. On reflection it seemed an odd thing for him to say. On further reflection it didn't. 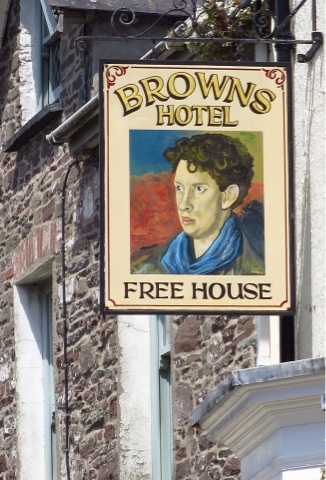 Dylan Thomas, poet and story teller, has been dead for more than 60 years but seems very much alive in the south of Wales. Mention his name and there is instant recognition. 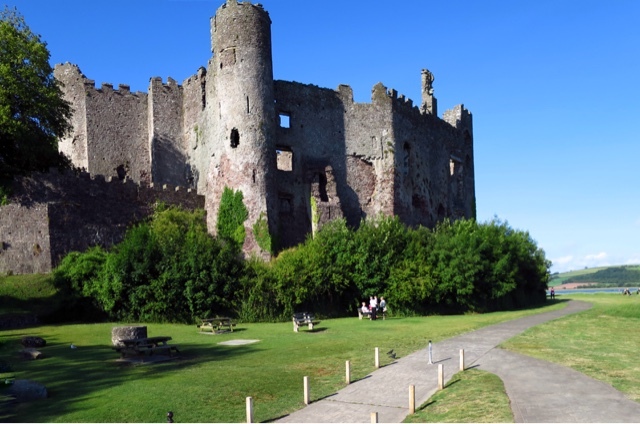 Mention Laugharne where he lived for four years and it's the same. 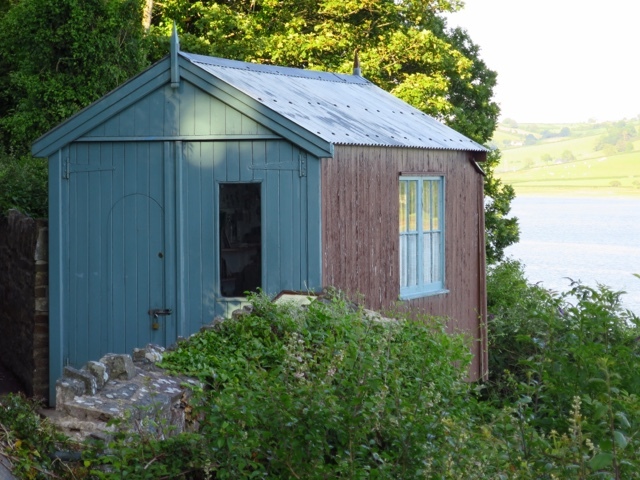 "Ah, The Boat House," people say referring to the waterfront cottage in Laugharne bought for the Thomas family by a patron, actress Margaret Taylor. 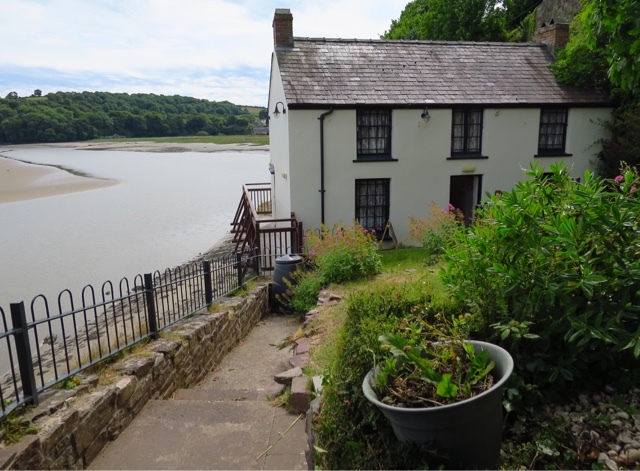 The Boat House, Laugharne, as it stands today. We were intrigued. In an age where poetry often takes a back seat to worn out pop lyrics and instant fame how could Dylan Thomas command so much respect? Dylan's influence - from the Beat Poets to the Beatles and Bob Dylan. 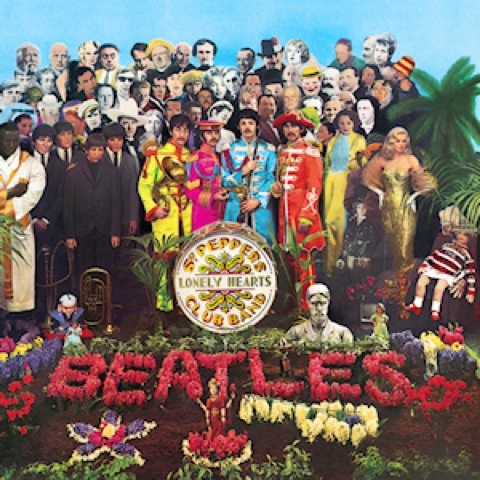 John Lennon wanted Dylan's picture included on the Sgt Pepper's album. And remember Bob Zimmerman, who became Bob Dylan via Bob Dillon. Part of it may be due to marketing which offers visitors to south Wales plenty of opportunities to indulge in Dylan mania. There is something called the Dylan Thomas Trail which takes in Swansea, the place of his birth; Carmarthen, where he and wife Caitlin would visit the farmers' market; Llandysul, the home of a literary ancestor and a list of other places with sometimes tenuous links. There are museums and CDs and mountains of books analysing his work and life, including his problems with alcohol. 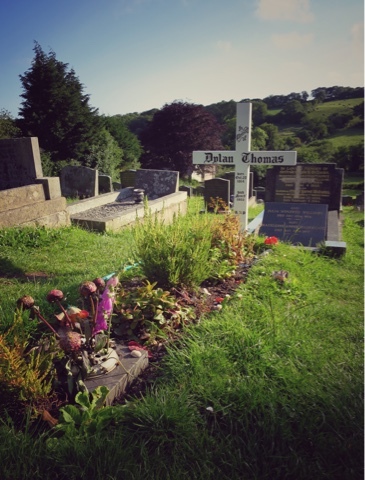 Dylan's grave in Laugharne cemetery. And last year, 2014, was the centenary of his birth marked by exhibitions, poetry readings and performances of Dylan's play for voices, Under Milk Wood. A new film version of it was shot in the small Welsh coastal town of Solva and is due for release soon. No wonder public awareness is high. 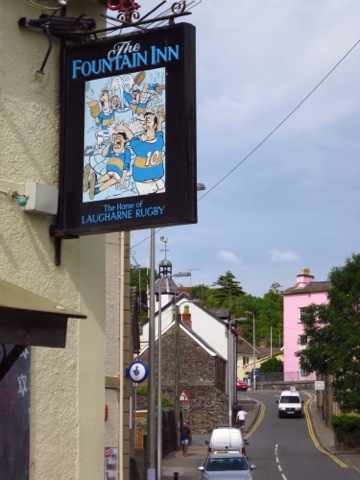 Dylan's favourite watering hole reminds visitors of its link to the Welsh poet. At Swansea we spent a happy afternoon in the Dylan Thomas Centre, listening to recordings, learning about his life and work, and even his composition methods which included writing long lists of rhyming words on strips of paper. "seashaken house built on a breakneck of rocks." 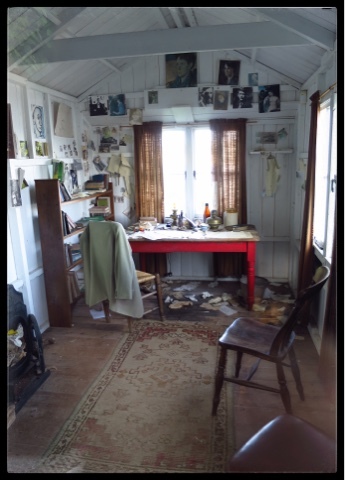 There were lots of pictures, newspaper clippings about his death, his poetry aloud from an old radio, a video documentary and peeks from the windows of the Taf Estuary - which influenced his work. But it was his writing room - once a garage - that caught our attention. Fifty metres from The Boat House, it has been left as if the poet had just walked out. A jacket over a chair, a cup, books stacked carelessly and crumpled balls of paper on the floor under the table, itself under a window with another tantalising view of the sea. The man was missing, but his work lives on. Nor heed my craft or art." It was in the writing room that Dylan struggled to finish Under Milk Wood. The conversation started at the men's urinal at Pontypridd's Blueberry Inn. Where are you going with that bike I was asked. 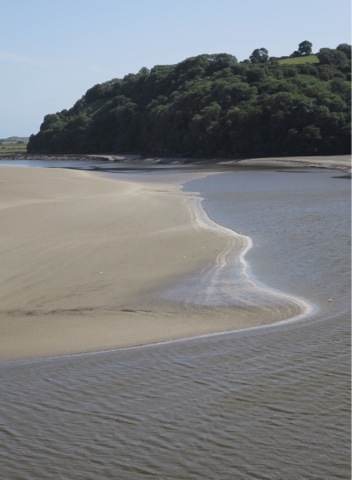 Swansea, Laugharne to see where Dylan Thomas lived, then west. It wasn't long before we were invited to join a table - James, Ange*, Angie and Nic were all Dylan fans and we had a highly entertaining night with them. and learned that Laugharne is pronounced larne, like barn. Nic had a deep voice with a rich timbre and a reputation for impersonating Richard Burton reciting Dylan Thomas. A couple of times Nic ventured half a line of Dylan, but maybe he needed one more drink (or was it one less) to encourage him. * Whoops, guessing at the spelling of the names here. Apologies if I have them wrong. And then there is rugby, but that's another story. In Laugharne itself we met a born and bred local whose father was a teenager when Dylan was at the height of his fame. The drinking bouts were legendary, and the young man with his teenage friends was sometimes invited back to party at The Boat House. "What was he like?" son asked the father years later. He remembered Dylan and wife Caitlin arguing a lot. Dylan was different. He stood out and had travelled. And he was fun to be around, although their age difference meant that the father was always on the fringes, not part of Dylan's inner circle. No, he never asked Dylan about his poetry. And there was a story, although its veracity cannot be checked. It's said that sometimes Dylan was so drunk descending the steps to The Boat House that to prevent himself falling into the sea he would climb down backwards on his hands and knees. 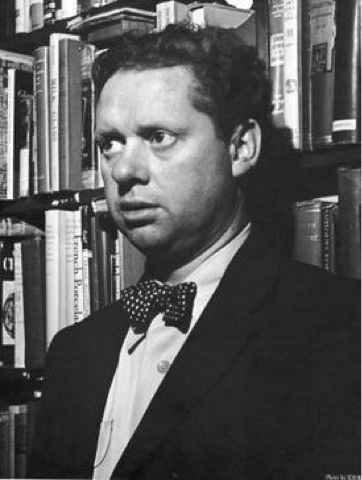 Dylan Thomas died on 9 November 1953 in New York. He was 39.